Are your ancestors hiding behind an alias or a pseudonym? Do you have an ancestor with a shady past? My second great grandmother may have perpetrated a fraud in Sonoma County, California between 1900 and 1902. 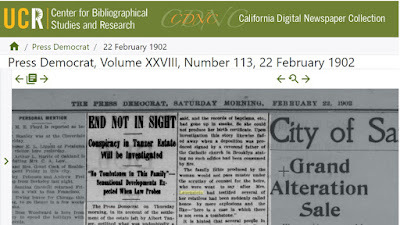 This wayward ancestor has been revealed thanks to the California Digital Newspaper Collection https://cdnc.ucr.edu. Annie Moss was the name that we had for our second great grandmother. As I had written in a previous blog http://www.ancestorpuzzles.com/2015/11/is-my-brickwall-about-to-tumble-down.html, we suspected that she had been married to John Lauenstein. She was described on his tombstone as Virginia Lauenstein but there were no records to confirm that Virginia Lauenstein and Annie Moss were the same person, until now. The California Newspaper site revealed that she had several aliases including Annie Moss, Virginia D. Hutchings and Virginia Lauenstein. She claimed to be the daughter of a man named Albert Tanzer who died possessed of a considerable estate. Tanzer was a resident of Rincon Valley near Santa Rosa and had 20 acres of vineyards and was making wine. He had amassed his fortune working as a machinist and a locksmith but was apparently in ill health. He sold his vineyard before moving to San Francisco where he died in 1900. The last newspaper article about this case infers that my 2nd great grandmother may have conspired with a man named J.M. Moffitt to pose as the sole heir of Albert Tanzer. These two conspirators may have been indicted and tried in Sonoma County. I am currently in pursuit of further records about this matter. I am hoping for new discoveries in the original probate file and any criminal court documents that might exist. There are many genealogical clues in this probate case but it is difficult to sort fact from fiction. But I can see through the cracks in my brick wall. The Press Democrat on Thursday morning, in its account of the settlement of the estate left by Albert Tanzer, outlined what was undoubtedly a deliberate attempt on the part of a woman, alleging herself to be a daughter of the deceased, to rob his lawful heirs of the $30,000 estate he left. As was stated, Mrs. Lauenstein of San Francisco, who sought to prove herself Tanzer’s daughter, was not allowed a cent by the Court who said to her from the bench with some force: “I am perfectly satisfied you are not Tanzer’s daughter and that you never saw Tanzer.” While the final account of the administrator has been settled and the property distributed to the heirs, the last chapter of this sensational story has yet to be written. Criminal proceedings will be brought against certain San Franciscans, one of whom J. M. Moffitt, formerly managed a restaurant here. It is hinted that Moffitt suggested to the woman the fact that “an old man, Tanzer by name, an old miser, had died leaving a large estate and no heirs in this country.” Attorney Humphrey of the law firm of Dent & Humphrey of San Francisco, became so certain the alleged daughter was an impostor that a detective was employed and it is said that as a result of the rigid investigation made, criminal proceedings will he brought against those who are believed to have hatched a conspiracy to rob a dead man's heirs of what is theirs by decree of court and the rights of relationship. When this woman first appeared, she was Mrs. Virginia Hutchings. A little later on in the litigation papers on file in court, will show she changed to Mrs. Virginia Lauenstein, having in the interval become the wife of a saloon man by that name. It Is said there are sensational details in connection with how this marriage was brought about which will be produced later. 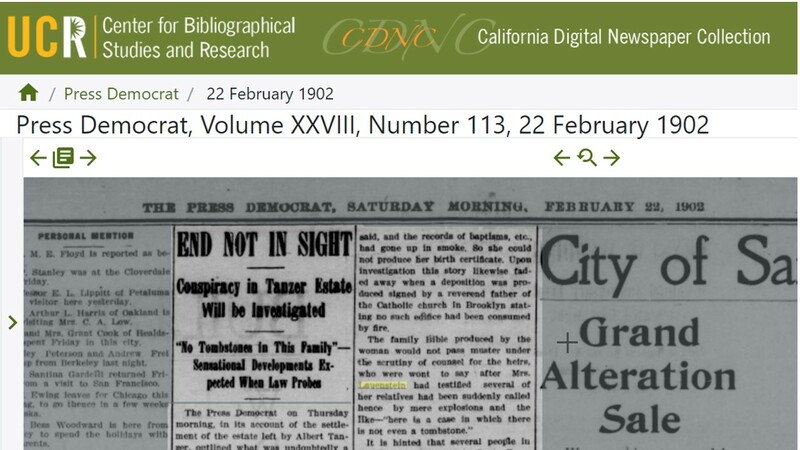 Mrs. Lauenstein’s story in support of her claimed relationship to Tanzer was a diversified one and did not stand when certain parts of it were investigated. For instance, she came to California, she said once on the witness stand, by a certain route, while in reality the railroad specified was not built for several years afterward. The church in Brooklyn in which she was baptized had been burned, she said, and the records of baptisms, etc., had gone up in smoke, so she could not produce her birth certificate. Upon investigation this story likewise faded away when a deposition was produced signed by a reverend father of the Catholic church in Brooklyn stating no such edifice had been consumed by fire. The family Bible produced by the woman would not pass muster under the scrutiny of counsel for the heirs, who were wont to say after Mrs. Lauenstein had testified several of her relatives had been suddenly called hence by mere explosions and the like — “here is a case in which there is not even a tombstone." It is hinted that several people in San Francisco, known in Santa Rosa, will be implicated in the investigation which will follow. Attorney Humphrey was not slow in telling a reporter it was one of the worst cases of conspiracy of which he had ever heard. In Judge Burnett’s department on Thursday the contest over the petition of Mrs. Virginia Hutchings for letters of administration on the estate of Albert Tanzer. was resumed. Among the witnesses called was Mrs. J. J. Whitney of Stockton street, San Francisco, who employed the petitioner, then known as Annie Moss. Mrs. Whitney did not remember the occasions when Albert Tanzer visited his alleged daughter while she was in her house. This was perhaps the most valuable nugget that was found in the many newspaper articles about this sensational probate case. Annie AKA Virginia claimed that her mother's name was Lucy Johnson and that she married a Mr. Hanks prior to her death. She also claimed to have an aunt and an uncle in California. No records have been found which substantiate her story but the search continues!